In 2008, Congress required Class I Railroad mainlines handling poisonous-inhalation-hazard materials and any railroad main lines with regularly scheduled intercity and commuter rail passenger service to fully implement Positive Train Control by December 31, 2015. PTC uses communication-based/processor-based train control technology that provides a system capable of reliably and functionally preventing train-to-train collisions, overspeed derailments, incursions into established work zone limits, and the movement of a train through a main line switch in the wrong position. In late 2015, Congress extended the deadline by at least three years to December 31, 2018, with the possibility for two additional years if certain requirements are met. The new legislation, the PTC Enforcement and Implementation Act, required that railroads submit a revised PTC Implementation Plan (PTCIP) by January 26, 2016, outlining when and how the railroad would have a system fully installed and activated. Providing more than $650 million to passenger railroads, including nearly $400 million in Recovery Act funding. Issuing a nearly $1 billion loan to the Metropolitan Transportation Authority to implement PTC on the Long Island Rail Road and Metro-North. Building a PTC testbed in Pueblo, Colorado. Making $25 million available in competitive grant funding to railroads, suppliers, and state and local governments. Working directly with the Federal Communications Commission (FCC) and the Advisory Council on Historic Preservation to resolve issues related to spectrum use and improve the approval process for PTC communication towers. Dedicating staff to continue work on PTC implementation in March 2010, including establishing a PTC task force. PTC Document Submission: Railroads meeting the requirements for PTC implementation must submit for FRA approval various PTC-related documents. Those documents are available on under each railroad's PTC docket number. To view detailed information, click on the timeline to enlarge. The graphic below displays a summary of when each railroad is targeted to complete their PTC implementation, as reported in the railroad’s revised PTC Implementation Plan. 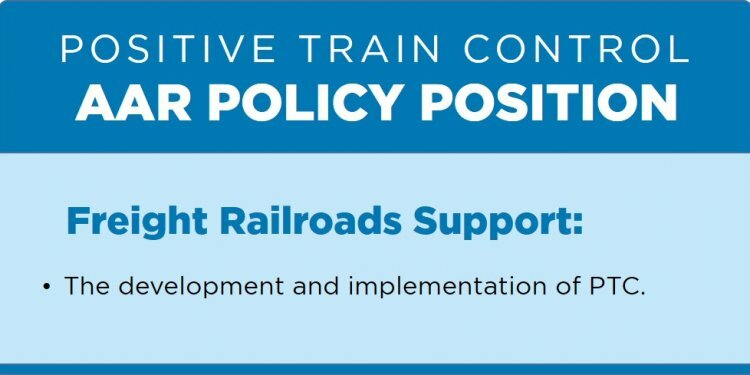 For more information on a specific railroad’s progress toward PTC implementation, see 2015 Annual PTC Progress Reports and PTC implementation status by railroad. The graphic below is a summary of current PTC implementation status broken down by major installation categories, as reported in each railroad’s quarterly update on PTC implementation progress.